Forget about tricks -- this little cutie is the perfect treat for your own special little ghoulie. 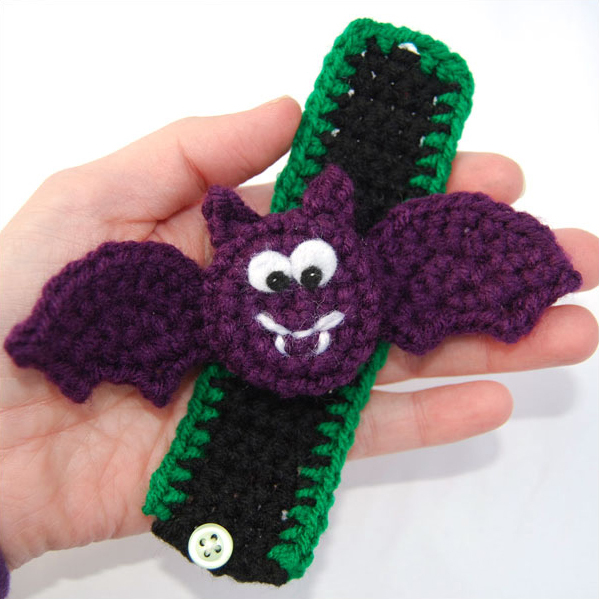 Designed with a removable bat pal, this bracelet proves that fashion can be fun too. And don't forget -- the bat cuff bracelet makes a great mix and match package with the free turtle and ladybug cuff bracelet patterns! Other Materials: Scrap amount of white yarn, small amounts of black and white felt or pencil eraser‐sized wiggle eyes, two buttons (one shirt‐button sized and the other about the size of a dime), thread, craft glue, yarn needle, sewing needle. Can´t find the link to download it!